29 August 2017 (Tuesday) – Forest Research Institute Malaysia (FRIM) Director General (DG) Dato’ Dr Abd Latif Mohmod received the BrandLaureate Most Eminent Brand Icon Leadership 2017 award for the ‘Environment Conservation’ category in Kuala Lumpur today. Abd Latif (middle, left) receiving the award from Althoff. 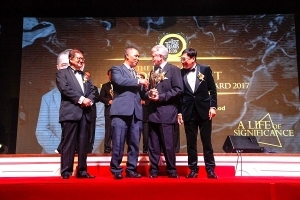 The award was presented by Tan Sri Rainer Althoff, Chair of the Asia Pacific Brands Foundation (APBF) at the APBF Award’s Gala Dinner. Abd Latif was chosen as one of the recipients based on his achievements and contributions to FRIM, particularly in strengthening the forestry and conservation research to protect this national heritage for future generations. 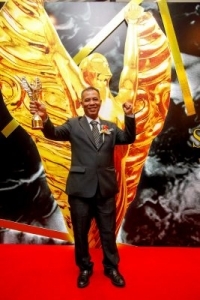 Throughout his career at FRIM, Abd Latif has made many achievements and received numerous awards. 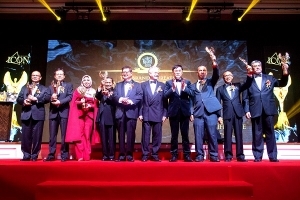 Among them were the Young Scientist Award in 1993; IUFRO Scientific Achievement Award (1995); Outstanding Young Malaysian (1999); and Top Research Scientist Malaysia (2013). More recently, he received ‘Anugerah Perdana Research and Development (R&D) Icon 2016’ from the National Book Development Foundation (2016). Abd Latif (third from right) posing for a picture with other recipients of the same award after the presentation ceremony. Under his leadership, FRIM was accorded the Mahathir Science Award and Nikkei Asia Prizes (2009); IDB Science and Technology Award 2012 and obtained 26 Malaysia Book of Records since 2008. After becoming a KP, he has been responsible for managing matters related to the operational management, human resources, finance, direction of various research and development (R&D) projects as well as the commercialisation of research findings from 2008. Abd Latif showing off the award after the ceremony. Abd Latif has been pushing for FRIM to attain the UNESCO World Heritage status and the FRIM nomination has been accepted in the tentative list of UNESCO in July 2017. His efforts had led to FRIM being gazetted as the Natural Heritage Site in 2009 and as a National Heritage in 2012. To ensure FRIM’s continuity, he worked towards getting the FRIM Bill gazetted in 2016. Under this FRIM Act, the institute can benefit from R&D results through commercialisation and conducting new research areas that contribute to the conservation of the country’s forests. 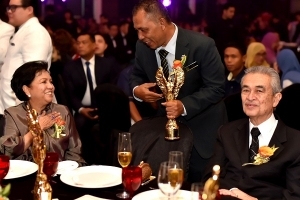 FRIM DG (middle) speaking to Tun Jeanne Abdullah, who received the BrandLaureatte Royal Quintessential Brand Icon Leadership Award, after greeting former Prime Minister, Tun Abdullah Ahmad Badawi, the APBF Patron. The ‘BrandLaureate Most Eminent Brand Icon Leadership’ award introduced by APBF in 2011 accords recognition to individuals for significant contributions to the growth and development of the country as well as the community. With the aspiration to promote branding awareness in Malaysia and around the world, APBF is actively involved in identifying and introducing excellent Malaysian brands to the international stage. Former FRIM DG, Tan Sri Dr Salleh Mohd Nor is one of the past recipients of the BrandLaureate Most Eminent Brand Icon Leadership Award in 2016. This award is particularly special for Abd Latif as he he celebrates his birthday today.